I'm not sewing on every card, but I sure am glad Linda, The Funkie Junkie twisted my arm and told me that once I got started I probably wouldn't be able to quit. This layout just begged me to distress, tear, and sew, so I gave in. 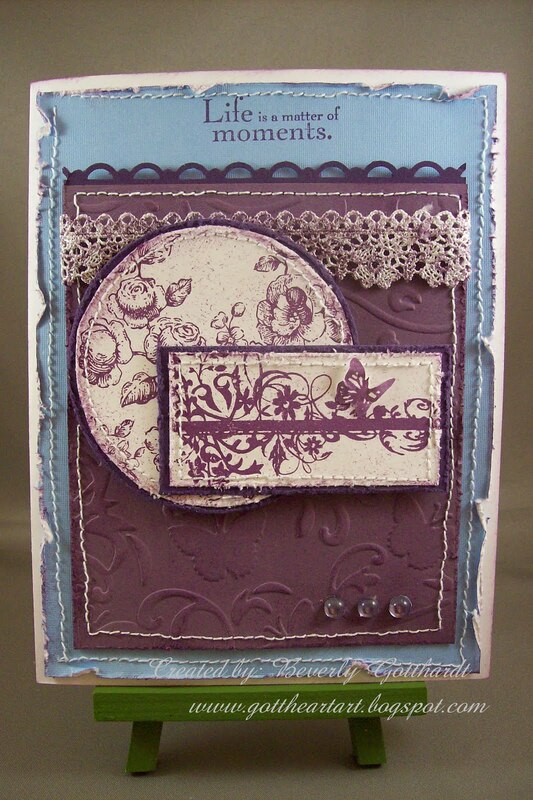 Supplies: White Card Blank 5 1/2" X 6" Halcraft, Papers: Stampin Up-Elegant Eggplant, Perfect Plum, Whisper White, softe blue textured card stock unknown, Stamps: Stampin Up-Elements of Style, Tim Holtz-CSS25856 Flights of Fancy, Ink: Stampin Up-Eggplant Envy, Stampin Up-Scallop Trim border punch, Cuttlebug embossing folder-Jules Jewells, Fiskars shape cutting template-Circles-1, Coluzzle shape cutting template-Circle, Gemstones-Hero Arts, lace-Offray, pop dots. Bravo Beverly. This is simply lovely. 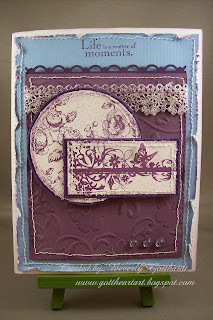 I love everything about it - the colors, the distressing, the two complimentary stamps and the sewing! This is the kind of art that make my heart sing! Yep, I agree with the others, love the sewing and the distressing. Wonderful card, great take on the sketch. Thanks so much for playing along! I love this!! Thanks for playing in the Color Dare!